Tomas Tatar and Karl Alzner are two different players — one a scoring winger, the other a bruising defenceman. But they can relate to each other this season. Coming off challenging seasons, Tatar and Alzner both are in the same pressure cooker that is the Montreal Canadiens dressing room. Tomas Tatar and Karl Alzner are two different players — one a scoring winger, the other a bruising defenceman. But they can relate to each other this season. Coming off challenging seasons, Tatar and Alzner both are in the same pressure cooker that is the Montreal Canadiens dressing room. Alzner was part of last year's team in Montreal that fell well short of the playoffs, while Tatar failed to make much of an impact with Vegas after getting dealt to the Western Conference champs from the Detroit Red Wings at the trade deadline. "A few times last year we just said, 'You know what? Bad game, let's get over it,' instead of actually getting to the root of the problem," Alzner said as the Canadiens reported for medicals on Thursday. "Hoping we can really set a good base right from day one here and figure it out." 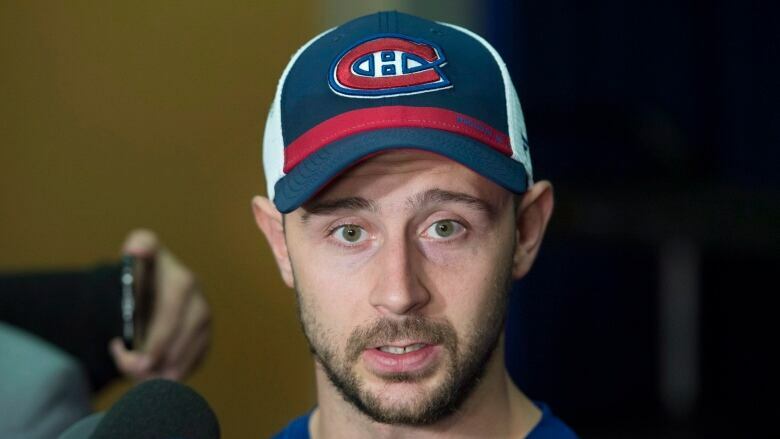 Tatar was acquired by the Canadiens in the Max Pacioretty trade earlier this week. The ex-Habs captain went to Vegas for Tatar, prospect forward Nick Suzuki and a second-round pick. While the Canadiens' off-season moves resemble that of a rebuild, general manager Marc Bergevin has emphasized his team is going through a "reset." It means newcomers like Tatar will be called on to solve the scoring woes that have plagued the team. "That kind of pressure is always on you. You want to score. You want to be productive," Tatar said. Alzner said that while the Canadiens don't have the "Ovis, the Backstroms, the Crosby and Malkin," there are some players who can score. But the statistics say otherwise. Only the Arizona Coyotes and the Buffalo Sabres scored fewer goals than the Habs last season. Pacioretty has had five 30-goal seasons, though he managed only 17 last year. The Canadiens also have parted ways with Alex Galchenyuk. The third overall pick from 2012 scored 19 goals and finished second on the team in points last season. While the Canadiens did have a first-time 30-goal scorer in Brendan Gallagher last season, pundits feel Montreal will struggle to score again this season. "If you're not scoring and not being productive and the team is losing, somebody's going to take the hit," Tatar added. Alzner was once in Tatar's shoes as a new, prominent player on the team. The six-foot-three Burnaby, B.C., native signed a five-year, $23.125 US million contract with the Canadiens during the 2017 off-season before scoring a goal and adding 11 assists in 82 games. "The first year, you see you've done things the same way for so long and you kind of expect it to be one way," Alzner said. Alzner has personal goals for himself this season. "I want to play faster," Alzner said. "I want to be able to push the pace a little bit more. I think last year, personally, I was back on my heels a little too much and waiting for stuff to come out. When you have as many good players as there are in the league, that's not good." There will be growing pains for incoming players like Tatar, but also for new assistant coaches Dominique Ducharme and Luke Richardson. In Montreal, however, no one escapes pressure and attention. "We have to pull together," Tatar added. "Play as one team. If someone won't be doing good, then somebody else has to replace him and help him out."